Venezuelan President Nicolás Maduro has devised a "rabbit plan" to counter the economic war he says is being waged against his government by "imperialist forces". Venezuela is facing record levels of child malnutrition amid persistent food shortages. An opposition politician said the plan was "a bad joke". President Maduro revealed the idea on state television, saying that "for animal protein, which is such an important issue, a 'rabbit plan' has been approved because rabbits also breed like rabbits". The leader did say that the "rabbit plan" had not got off to a good start and the minister of urban agriculture, Freddy Bernal, said there had been a "cultural problem". President Maduro said rabbit kittens had been handed to 15 communities as part of a pilot project by Mr Bernal. "When he came back, to his surprise he found people had put little bows on their rabbits and were keeping them as pets, it was an early setback to Plan Rabbit." 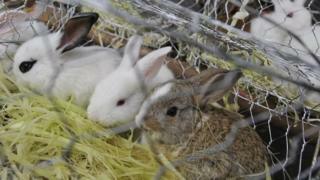 "A lot of people gave names to the rabbits, they took them to bed," Mr Bernal said. The minister urged Venezuelans to start seeing rabbits "from the point of view of the economic war". Amid laughter from fellow ministers at a cabinet meeting, he said that "we need a publicity campaign on radio, TV, in newspapers, in cartoons, everywhere, so that the people understand that rabbits aren't pets but two and a half kilos of meat". The Venezuelan government routinely blames the "economic war" on everything from shortages of food to medicines and toiletries. It alleges that "imperialist forces" are trying to cripple the country economically in order to oust its socialist leader but the opposition says government mismanagement is to blame. Venezuela, which has the biggest proven oil reserves in the world, has historically relied heavily on imports for everything from food to basic staples. Image caption Graffiti in Caracas reads: "We're hungry"
But with the price of oil plummeting in recent years, the government's reserves have dwindled. The situation is further exacerbated by rampant inflation and the fact that the sale of dollars is controlled by the state. State-imposed price controls on basic staples meant that many businesses producing food closed because they were operating at a loss. While the government has encouraged the creation of food co-operatives and urban agriculture, it has not been enough to cover Venezuelan's needs. A survey carried out earlier this year suggested that three quarters of Venezuelans had lost an average of 8.7kg (19lb) in weight due to the economic crisis.